The next time one of your conservative friends speaks poorly of the American Civil Liberties Union, have them look here (and here). The ACLU exists to defend the civil liberties of all Americans. The ACLU vigorously defends the right of Americans to practice religion. But because the ACLU is often better known for its work preventing the government from promoting and funding selected religious activities, it is often wrongly assumed that the ACLU does not zealously defend the rights of religious believers, including Christians, to practice their religion. The cases below - including several where the ACLU even defended the rights of religious believers to condemn homosexuality or abortion - reveal just how mistaken such assumptions are. Although the cases described below emphasize "the free exercise of religion," the guarantees of the Establishment Clause also protect the rights of religious believers (and non-believers) from having the government promote some religious beliefs over others. The ACLU of North Carolina (2007) wrote a letter to the Dismas Charities Community Correction Center on behalf of a former resident who was not allowed to consume wine during communion services while staying at the Center. After the ACLU advised the Center of its obligations under the Religious Land Use and Institutionalized Persons Act of 2000, the Center revised its policy to comply with federal law. The ACLU of North Carolina (2007) challenged a North Carolina Department of Corrections policy making all religious services in prison English-only, thereby denying access to many inmates. The North Carolina Division of Prisons agreed to review the policy and the need for religious services in languages other than English in the state correctional system. The ACLU of North Carolina (2007) assisted with the naturalization of a Jehovah's Witness who had been told he could not obtain United States citizenship because of his conscientious refusal to swear an oath that he would be willing to bear arms on behalf of the country. With the help of the ACLU of Pennsylvania, Greater Pittsburgh Chapter (2004), an Episcopal social services group was able to keep its program of feeding the homeless running. The County Health Department reversed its decision that meals served to homeless people in a church must be cooked on the premises, as opposed to in individual homes. Had the decision not been reversed, the ministry would have been forced to cease the program. The ACLU of Massachusetts (2003) intervened on behalf of a group of students at Westfield High School who were suspended for distributing candy canes and a religious message in school. The ACLU of Rhode Island (2003) interceded on behalf of an interdenominational group of carolers who were told they could not sing Christmas carols on Christmas Eve to inmates at the women's prison in Cranston, Rhode Island. I've been trying to stay away. Other than the minor fact that abortion is still a legal medical procedure in this state when performed by a licensed physician and with the concurrence of the woman , is there anything about this post by Jessica McBride that even resembles logical thought ... oh hell, how about adult thought? An Appleton man is correctly charged with "first-degree murder of an unborn child." So why aren't women who abort their unborn children charged with the same offense? The only difference is who's taking the life. But the life is the same no matter who's taking it. If it wasn't a life, he wouldn't have been charged. So, logically, if it's a life, as the system has thus conceded, why do some people have the right to take it? Can you think of any other crime where the victim is the same, and there is the intentional taking of life, but there's different legal consequence for different perpetrators? The only analogy I can think of is for mentally ill defendants or juveniles - same victim, different punishment. Another example of the “brilliance” and “genius” of the right side of the cheddarsphere, I guess. MADISON — The Republican Party of Brown County will be reorganized after recent vacancies in key offices created a constitutional technicality, the chairman of the state party said today. Reince Priebus, state chairman of the Republican Party of Wisconsin, said the Brown County group has been decertified by the state, but not because of the recent legal troubles of its former chairman, Donald Fleischman of Allouez. Fleischman resigned in September after charges of child enticement were brought against him in Brown County Circuit Court; they have since been dropped. Priebus called the reorganization “tangential” to Fleischman’s predicament.Fleischman’s resignation created two vacancies in the party’s officer corps. Holly Arnold, the first vice-chair, did not want the top spot, and the second vice-chair position already was vacant, Priebus said.That meant the party didn’t have enough officers to call a caucus to elect new officers, Priebus said. At Arnold’s request, the state GOP decertified the county party on Nov. 13. As Freddy the Clown might say, "Oh, the hypocrisy." 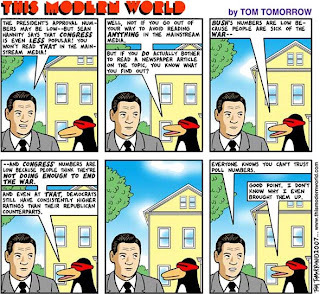 The next time you hear some clown named Fred say, "Yeah, but Congress' poll numbers are even lower," check this "brilliant" Tom Tomorrow cartoon out. Good. There's been enough said. Another Internet phenomenon sent to me by my Mother. The flood of American liberals sneaking across the border into Canada has intensified in the past week, sparking calls for increased patrols to stop the illegal immigration. The actions of President Bush are prompting the exodus among left-leaning citizens who fear they'll soon be required to hunt, pray, and agree with Bill O'Reilly. Canadian border farmers say it's not uncommon to see dozens of sociology professors, animal-rights activists and Unitarians crossing their fields at night. "I went out to milk the cows the other day, and there was a Hollywood producer huddled in the barn," said Manitoba farmer Red Greenfield, whose acreage borders North Dakota. "The producer was cold, exhausted and hungry. He asked me if I could spare a latte and some free-range chicken. When I said I didn't have any, he left. I didn't even get a chance to show him my screenplay." In an effort to stop the illegal aliens, Greenfield erected higher fences, but the liberals scaled them. So he tried installing speakers and blared Rush Limbaugh across the fields. "Not real effective," he said. "The liberals still got through, and Rush annoyed the cows so much they wouldn't give milk." Officials are particularly concerned about smugglers who meet liberals near the Canadian border, pack them into Volvo station wagons, drive them across the border and leave them to fend for themselves. "A lot of these people are not prepared for the ugged conditions," an Ontario border patrolman said. "I found one carload without a drop of drinking water. They did have a nice little Napa Valley cabernet, though." When liberals are caught, they're sent back across the border, often wailing loudly that they fear retribution from conservatives. Rumors have been circulating about the Bush administration establishing re-education camps in which liberals will be forced to drink domestic beer and watch NASCAR races. In recent days, liberals have turned to sometimes-ingenious ways of crossing the border. Some have taken to posing as senior citizens on bus trips to buy cheap Canadian prescription drugs. After catching a half-dozen young Vegans disguised in powdered wigs, Canadian immigration authorities began stopping buses and quizzing the supposed senior-citizen passengers on Perry Como and Rosemary Clooney hits to prove they were alive in the '50s. "If they can't identify the accordion player on The Lawrence Welk Show, we get suspicious about their age," an official said. Canadian citizens have complained that the illegal immigrants are creating an organic-broccoli shortage and renting all the good Susan Sarandon movies. "I feel sorry for American liberals, but the Canadian economy just can't support them," an Ottawa resident said. "How many art-history majors does one country need?" *The Manitoba Herald was published daily from January 11, 1877 until August 2, 1877. Its intention was to defend the interests of Manitoba and to keep an eye on the behaviour of the province’s representatives. From the Milwaukee Journal Sentinel we learn that Walid Shoebat, ostensibly a former terrorist (PLO member) and now a Christian fundamentalist anti-Islamic speaker, was asked to give a speech at UW-Milwaukee on December 4 by the Conservative Union, a student group that promotes conservative issues. We also learned that Muslim Student Association President Mohamed Elsayed and Palestinian Student Organization President Lina Abdulkarim wrote a Nov. 20 e-mail to UWM administrators demanding that they cancel the Shoebat program. They apparently described his appearance as a "direct attack" on Muslim students. Of course Charlie Sykes and the right wing blogosphere jumped all over this and the fact that UWM has asked for additional funds to pay for added security, thereby imposing additional financial burden on the Conservative Union (ask Sensenbrenner for the money). As usual, one's outrage is another's reasonable request. And so it goes. Whatever. In any case, I think this is a good lesson for our visiting Muslim friends. They made a request to have Shoebat's visit cancelled, it was rejected. They had a right to make the request as much as the Conservative Union had to invite Shoebat. Done deal. First Amendment wins. The Muslim students have said they will not venture out to cause trouble, instead they plan to hold a forum to discuss Shoebat's accusations. I'd bet much of the local "talent" on the right side of the blogosphere wouldn't be so understanding. I'm always on the side of the marketplace of ideas. Shoebat should be allowed to speak. But I couldn't help but be a little curious. I knew very little about this man, so I spent a significant amount of time (more than I would normally considering I actually have a life) doing some Internet research. What I found was summed up nicely by this person, Moshe Katz (a commenter at Daniel Pipe's blog). Has anyone heard of this supposed "Palestinian" darling of the Zionist movement, Walid Shoebat? I've read his articles and something doesn't sound right with this guy. He claims to be Palestinian but nobody in the territories has ever heard of him. He says he was a former PLO fighter but strangely enough he doesn't have any documentation or proof to back up his claims. Lately, he's been selling his services to many different Jewish organizations. My cousin saw him at a college lecture and was shocked at his insistence that Palestinians are actually Nazis in disguise. I'm the first to condemn Palestinian terror but we should never discount the fact that it was European Christians who slaughtered six million Jews. Nobody should ever be compared to the Nazis - they have a special place in the wrath of Hashem. Have you ever heard the phrase "never trust a man who sells out his own people". That sums up Shoebat. He is too right wing in his rhetoric. He claims to be a former Moslem who now embraces Christianity and loves Israel. Well, how can you love Israel if the only road to salvation is through Jesus Christ? How can you proclaim your admiration for the Jewish people if you feel they are lost in not accepting Christ as the Messiah? From what I've read on many posts, Shoebat is a former Lebanese militiaman who was brought over to Israel after the Southern Lebanon fiasco. He then set out to proclaim himself a Palestinian. In the end he is a former member of the Christian Phangist (Fascist) party who's making a living telling Jews what they want to hear. I'm one who will plant a tree in Israel before I give this man a dime. G*D help us all if Jewish organizations keep buying snakeoil from charlatans. To be generous, Shoebat is an oddball. But for propaganda purposes people like Shoebat are useful fools, and they are taken on tour in the United States, Canada, Ireland and elsewhere in Europe to score cheap propaganda points to denigrate Palestinians in general, smearing all of them with broad smears, and to equate Islam with a "malevolent Jihadist ideology". Shoebat's statements are offensive and smear most Palestinians and Islamic groups with broad denigrating brushstrokes. Often his comments are contradictory, but this is no bar for putting him on an international tour. For example, since Shoebat is billed as a "PLO terrorist" then this would give him some credibility to smear the PLO, but he is also used to smear some Islamic groups, and Islam in general; he also denigrates/smears the ISM (a non-violent solidarity movement run by Christians, Jews, and Muslims) by accusing it of supporting a malevolent and violent jihadist ideology. Back to Moshe Katz and Daniel Pipes. I shouldn't have been surprised that Daniel Pipes, noted Arab hater, would show up as a Shoebat supporter. He actually responded to Mr. Katz, though the response left a bit to be desired factwise. (1) Mr. Shoebat showed me a number of documents in several languages - official papers, newspaper clippings, and the like. I read them when he visited me but did not keep copies. (2) He admits that he can document his life but not his having been a near-terrorist. He asks that that be taken on faith, given that the rest of his life is as he says it is. I see no reason to doubt him. On more than one occasion, Pipes has called for the extension of Israel's already ruthless policy of collective punishment, arguing that leveling Palestinian villages is justifiable if attacks are launched from among their inhabitants. It seems to me from observing his style that he came to this conclusion with rather more relish than regret. The objection to Pipes is not, in any case, strictly a political one. It is an objection to a person who confuses scholarship with propaganda and who pursues petty vendettas with scant regard for objectivity. Okay, I'll admit no where does it say he wants to eliminate Palestinians, but there is some groundwork laid for feeling unkind things for Palestinians. He is best known for his strident and often racist denunciations of Arabs and Islam. In an effort to divide Americans -- one that if you inserted "blacks" for "Muslims" and "whites" for "Jews," would be vigorously damned as KKK-speech -- he told the American Jewish Congress a year ago that he worries "the presence and increased stature, and affluence, and enfranchisement of American Muslims...will present true dangers to American Jews." Well, I think you get the idea. Anyone supported by Pipes has got to be a little questionable. Inspiration for this post provided by that paragon of Wigginess, Mr. James Wigderson at Wigderson Library & Pub, a happily demented Dallas Cowboys fan. For another game and another take on the rivalry, here's a link to the Brew City Brawler, who takes you down memory lane for a recap of a recent shellacking of the Cowgirlsboys by the Pack. The 1967 National Football League Championship Game between the Green Bay Packers and the Dallas Cowboys was the 35th championship game in NFL history. Popularly known as the Ice Bowl, it is widely considered one of the greatest games in NFL history, due in part to the hostile conditions in which it was played, the importance of the game, the rivalry between the two teams and the dramatic conclusion. This was the second consecutive NFL championship game played between the two teams. In the previous season, the Packers defeated the Cowboys 34-27 by preventing Dallas from scoring a touchdown on four consecutive plays starting from the Packers 2-yard line on the game's final drive. The 1967 game, played on December 31, 1967 at Lambeau Field in Green Bay, Wisconsin, remains the coldest NFL game on record. The official game-time temperature was -13°F / -25°C, with a wind chill around -48°F / -44°C. The bitter cold overwhelmed Lambeau's new turf heating system, leaving the playing surface hard as a rock and nearly as smooth as ice. The officials were unable to use their whistles after the opening kickoff; the referee blew his metal whistle to signal the start of play and it froze to his lips. For the rest of the game, the officials used their voices to end plays. Several players, including Dallas defensive tackle Jethro Pugh and Green Bay quarterback Bart Starr, still claim to suffer occasional mild effects of the frostbite they developed that day. The Dallas quarterback, Don Meredith, came down with pneumonia after the game and was hospitalized on his return to Texas. In addition to the effects of the weather, Starr absorbed a lot of punishment from Dallas players during the game; he was sacked eight times. Furthermore, the Wisconsin State University - La Crosse Marching Chiefs band were supposed to perform the pregame and halftime shows. During warmups in the brutal cold, the woodwind instruments froze and wouldn't play, the mouthpieces of brass instruments got stuck to the players' lips, and seven members of the band were transported to local hospitals for hypothermia. The band's performances were canceled. The Packers jumped to an early 14-0 lead with a pair of touchdown passes from Starr to wide receiver Boyd Dowler. But Green Bay committed two costly turnovers in the second quarter that led to 10 Dallas points. First Starr lost a fumble while being sacked by Cowboys lineman Willie Townes; Dallas defensive end George Andrie recovered the ball and returned it 7 yards for a touchdown, cutting the lead in half. Then, with time almost out in the second quarter, Packers safety Willie Wood fumbled a Dallas punt after calling for a fair catch, and Cowboys rookie defensive back Phil Clark recovered the ball at the Green Bay 17-yard line. The Packers were able to keep Dallas out of the end zone, but kicker Danny Villanueva kicked a 21-yard field goal to cut the deficit to 14-10 by halftime. Neither team was able to score any points in the third quarter, but then on the first play of the final period, the Cowboys took a 17-14 lead with running back Dan Reeves' 50-yard touchdown pass to wide receiver Lance Rentzel on a halfback option play. Later in the quarter, the Packers drove into scoring range and had a chance to tie the game, but kicker Don Chandler missed a 40-yard field goal attempt. Starting from his own 32-yard line with 4:54 left in the game, Starr led his team down the field with three key completions: a 13-yard pass to Dowler, a 12-yarder to running back Donny Anderson, and a 19-yard throw to fullback Chuck Mercein. Then Mercein ran 8 yards to a first down on the Cowboys' 3-yard line on the next play. Twice Anderson attempted to run the ball into the end zone, but both times he was tackled at the 1-yard line, the second time after his footing failed on the icy field. After Anderson's second attempt, Starr called the Packers' final timeout with only 16 seconds left in the game to confer with coach Vince Lombardi and decide on the next play. Starr asked for a sneak, and Lombardi's response was "Well run it, and let's get the Hell out of here". Some observers (and Dallas players) expected the play would be a pass because a completion would win the game, while an incompletion would stop the clock, allowing the Packers another play to attempt a touchdown or kick a field goal to send the game into overtime. But Green Bay's pass protection had been poor, and Starr's throws late in the game had been mostly short and out in the flat; in this treacherous footing, the touchdown-or-incompletion alternative was not guaranteed. So Green Bay had other ideas. After taking the snap, Starr executed a quarterback sneak behind center Ken Bowman and guard Jerry Kramer's block through defensive tackle Jethro Pugh, scoring a touchdown that gave the Packers a 21-17 win and their unprecedented third consecutive NFL championship. 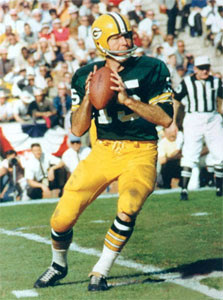 The Packers' final play was selected in a sideline conference between Starr and Lombardi. As reported in the book, When Pride Still Mattered: A Life of Vince Lombardi, by David Maraniss (1999), the coach wanted to get the game over with, one way or another, before conditions became worse, rather than attempting a tying field goal. The field goal try was no certainty given the conditions; and if it were successful, it would have sent the game into a grueling overtime period. As reported in the Maraniss book and also in The Packers!, by Steve Cameron (1995), the called play was a handoff to Mercein. Starr decided, but did not tell anyone, that he would keep the ball and avoid the risk of a fumble. Following the touchdown, the Packers had to kick off to the Cowboys, but Dallas was unable to advance the ball in the few remaining seconds, and Green Bay had the victory. The Starr dive became legendary. It was the climax of Jerry Kramer's Instant Replay, a diary-style account of the whole 1967 season that illustrated the theretofore anonymous life of an offensive lineman. Overlooked sometimes is the long, desperate fourth-quarter drive that led to the score, wherein a host of offensive players contributed, as well as the heroic efforts of the players on both teams for the entire game. Green Bay went on to finish the postseason by easily defeating the American Football League (AFL) champion Oakland Raiders in Super Bowl II, which at the time was still considered by many to be of lesser importance than the NFL championship itself. However, Lombardi made it clear that losing the game was not an option, and the Packers gave it all they had. The game was the end of several eras. With Green Bay having won five championships in seven years, Lombardi retired. The following year age and injuries caught up to the team and they had a losing record; it would be almost 30 years before the team would become a dominant force again, in the Brett Favre era of the 1990s. Dallas rebounded to one of the top teams of the 1970s, winning two Super Bowls in that decade, but Don Meredith would never win a championship, and he would soon become more famous as an announcer for Monday Night Football than he had been as a player. This would also be the last year that the NFL championship game was considered more important than the Super Bowl, for in the following year Joe Namath and the New York Jets staged an upset victory over the Baltimore Colts that would bring the AFL to full legitimacy. Lambeau Field supposedly got its nickname, "The Frozen Tundra", from an NFL Films highlight film of the game that included in its narration the phrase, "the frozen tundra of Lambeau Field," spoken by "the voice of God," John Facenda. However, Steve Sabol of NFL Films has denied that Facenda used the phrase; it is believed that an imitation of Facenda by ESPN sportscaster Chris Berman popularized the phrase. One reason this game is so famous is because it featured numerous players who would later be enshrined in the Pro Football Hall of Fame, as well as the head coaches of both teams.